Ya-Fang Avon Lin, Cheng-Yuan Kelvin Li, Yanina Kalinicheva, Ming-Chyi Huang, Chao-Hui Lee, Hao-Chuan Wang, Hao-Hua Chu, Case Study of Adapting a Phone-based Support System to Enable Drug-dependent Patients to Develop Coping Skills, ACM CHI 2017, May 2017. Bo-Jhang Ho, Hsin-Liu (Cindy) Kao, Nan-Chen Chen, Chuang-Wen You, Hao-Hua Chu, Ming-Syan Chen, HeatProbe: A Thermal-based Power Meter for Accounting Disaggregated Electricity Usage, ACM UbiComp 2011, Sept. 2011. [acceptance rate 16%]. 門村 亜珠沙, 李 爭原, 塚田 浩二, 朱 浩華, 椎尾 一郎, 「食行動改善を促すスマートフォン連動型センサ内蔵フォーク」, 情報処理学会論文誌 (Journal of Information Processing), Volume 56, Number 1, Jan. 2015, pp 338-348. [SCI] Chien-Nan Chen, Cing-Yu Chu, Su-Ling Yeh, Hao-hua Chu, Polly Huang, Modeling the QoE of Rate Changes in SKYPE/SILK VoIP Calls, IEEE/ACM Transactions on Networking, Volume 22, Issue 6, , Dec 2014, pp 1781-1793. [SCI] Chuang-Wen You, Hsin-Liu (Cindy) Kao, Bo-Jhang Ho, Yu-Han Chen, Wei-Fehng Wang, Lien-Ti Bei, Hao-Hua Chu, Ming-Syan Chen, ConvenienceProbe: A Phone-based Data Collection and Access System for Retail Trade Area Analysis, IEEE Pervasive Computing Magazine, Volume 13, Issue 1, , Jan-Mar. 2014, pp 64-71. [SCI] Meng-Chieh Chiu, Cheryl Chia-Hui Chen, Shih-Ping Chang, Charlotte Wang, Fei-Hsiu Hsiao, Polly Huang, Hao-Hua Chu, Motivating the Motivators: Lessons Learned from the Design and Evaluation of a Social Persuasion System, Elsevier Pervasive and Mobile Computing, Volume 10, Part B, Pages 203-221, February, 2014. Kuo-Chen Wang, Ming-Tung Hong, Cindy Hsin-Liu Kao, Allen C. Lin, Chi-An Wang, Chuang-Wen You, Chun-Hung Pan, Ming-Chyi Huang, Chun-Mao Liang, Hao-Hua Chu. 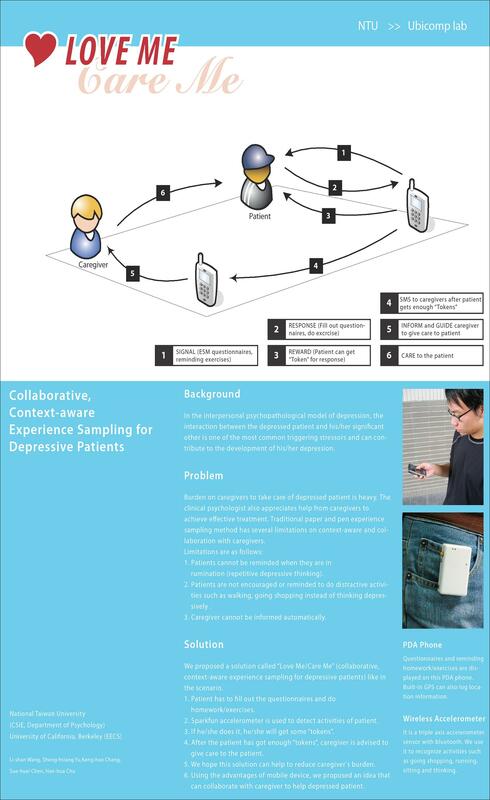 A Phone-based Support System to Assist Alcohol Recovery, ACM CHI 2013, Work-In-Progress, April, 2013. Azusa Kadomura, Cheng-Yuan Li, Yen-Chang Chen, Koji Tsukada, Itiro Siio, Hao-Hua Chu, Sensing Fork: Eating Behavior Detection Utensil and Mobile Persuasive Game, ACM CHI 2013, Works-In-Progress, April, 2013. [SCI] Ted Tsung-Te Lai, Wei-Ju Chen, Yu-Han Tiffany Chen, Polly Huang, Hao-Hua Chu, Mapping Hidden Water Pipelines using a Mobile Sensor Droplet, in ACM Transactions on Sensor Networks, Volume 9, Issue 3, August 2013. Cindy Hsin-Liu Kao, Bo-Jhang Ho, Allen C. Lin, Hao-Hua Chu, Phone-based Gait Analysis to Detect Alcohol Usage, ACM UbiComp 2012, Poster Session, Pittsburgh, PA, USA, September 2012. Nan-Chen Chen, Kuo-Cheng Wang, Hao-Hua Chu, Listen-to-Nose: A low-cost system to record nasal symptoms in daily life, ACM UbiComp 2012, Poster Session, Pittsburgh, PA, USA, September 2012. Cheng-Yuan Li, Hao-Hua Chu, BlimpProbe: An Aerial Surveillance Platform, ACM/IEEE IPSN 2012, Poster Session, April, 2012. Tsung-Te (Ted) Lai, Ya-Yunn Su, Hao-hua Chu, BikeTrack: Tracking Stolen Bikes through Everyday Mobile phones and Participatory Sensing, In Proceedings of Second International Workshop on Sensing Applications on Mobile Phones (PhoneSense2011) , Seattle, November 2011. Chao-Lin Wu, Yu-Te Huang, Cheng-Lung Wu, Hao-hua Chu, Polly Huang, and Ling-Jyh Chen An adaptive duty-cycle scheme for GPS scheduling in mobile location sensing applications, In Proceedings of Second International Workshop on Sensing Applications on Mobile Phones (PhoneSense2011) , Seattle, November 2011. [SCI] Chuang-Wen You, Chih-Chiang Wei, Yi-Ling Chen, Hao-Hua Chu, Ming-Syan Chen, Using Mobile Phones to Monitor Shopping Time at Physical Stores, IEEE Pervasive Computing, vol. 10, no. 2, pp. 37-43, Apr-June. 2011. Nan-Chen Chen, Bo-Jhang Ho, Hsin-Liu Kao, Chuang-Wen You, Hao-Hua Chu, Ming-Syan Chen, HeatProbe: a Thermal-based Power Meter System for Tracking Per-user Power Consumption, Pervasive 2011, Poster Session, San Francisco, CA, USA, June 2011. [SCI] Sheng-Hsiang Yu, Li-Shan Wang, Hao-Hua Chu, Sue-Huei Chen, Cheryl Chai-Hui Chen, Chuang-Wen You, Polly Huang, Mobile Mediation Tool for Improving Interaction between Depressed Individuals and Caregiver, Springer/ACM Personal and Ubiquitous Computing, Volume 15, Number 7, 2011, pp. 695-706. [SCI] Hsiu-Hsin Tsai, Yun-Fang Tsai, Hsiu-Hung Wang, Yue-Cune Chang, Hao Hua Chu, Videoconference program enhances social support, loneliness, and depressive status of elderly nursing home residents, Aging & Mental Health, Volume 14, Issue 8, November 2010, pp 947-954. Chuang-Wen You, Chih-Chiang Wei, Yu-Han Chen, Jya-Cheng Hu, Wei-Fehng Wang, Hao-Hua Chu, Lien-Ti Bei, Ming-Syan Chen, Convenience Probe: a Participatory Sensing Tool to Collect Large-Scale Consumer Flow Behaviors", ACM UBICOMP 2010, Poster Session, Copenhagen, Denmark, September 2010. [SCI] Jen-Hao Chen, Pei-Yu Peggy Chi, Hao-Hua Chu, Cheryl Chia-Hui Chen, Polly Huang, Pervasive Computing in a Smart Kitchen for Nutrition-Aware Cooking, IEEE Pervasive Computing Magazine, Oct.-Dec. 2010. [SCI] Arvin Wen Tsui, Wei-Cheng Lin, Wei-Ju Chen, Polly Huang, Hao-Hua Chu, Accuracy Performance Analysis between War Driving and War Walking in Metropolitan WiFi Localization, IEEE Transactions on Mobile Computing, vol. 9, no.11, pp. 1551-1562, November 2010. Jyh-How Huang, Po-Yen Lin, Yu-Te Huang, Seng-Yong Lau, Ling-Jyh Chen, Kun-chan Lan, Hao-hua Chu, Polly Huang, User-Centric Radio Power Control for Opportunistic Mountain Hiking Networks, IEEE/ACM IPSN 2010, Poster Session, April 2010. Kai-Yi Cheng, Rong-Hao Liang, Hung-Jung Lin, Bing-Yu Chen, Ming-Yang Yu, Hao-Hua Chu, Yu-Ming Chu, Sy-Yen Kuo, MemoIcon: Using Everyday Objects as Physical Icons, ACM SIGGRAPH Asia 2009, Emerging technologies, December 2009. [SCI] Arvin Tsui, Yu-Hsiang Chuang, Hao-hua Chu, Unsupervised Learning for Solving RSS Hardware Variance Problem in WiFi Localization, Springer/ACM Mobile Networks and Applications (MONET) Journal, 14 (5), pp. 677-691, October 2009. [SCI] Jin-Ling Lo, Pei-yu (Peggy) Chi, Hao-Hua Chu, Hsin-Yen Wang, Seng-Cho T. Chou, Pervasive Computing in Play-Based Occupational Therapy for Children, IEEE Pervasive Computing Magazine, vol. 8, no. 3, pp. 66-73, July-Sept. 2009. [SCI] Kuan-Ta Chen, Jhih-Wei Jiang, Polly Huang, Hao-Hua Chu, Chin-Laung Lei, Wen-Chin Chen, Identifying MMORPG Bots: A Traffic Analysis Approach, EURASIP Journal on Advances in Signal Processing, Volume 2009, 2009. [SCI] Tsung-Han Lin, Polly Huang, Hao-Hua Chu, Chuang-Wen You, Energy-Efficient Boundary Detection for RF-Based Localization Systems, IEEE Transaction on Mobile Computing, vol. 8, no. 1, pp. 29-40, January 2009. [SCI] Chuang-wen You, Polly Huang, Hao-Hua Chu, Yi-Chao Chen, Ji-Rung Chiang, Seng-Yong Lau, Impact of Sensor-Enhanced Mobility Prediction on the Design of Energy-Efficient Localization, Elsevier Ad Hoc Networks, Volume 6, Issue 8, 2008, pp 1211-1237. Tsung-Han Lin, Keng-hao Chang, Jr-ben Tian, Hao-hua Chu, Polly Huang, Modeling and Simulation Comparison of Two Time Synchronization Protocols, ACM MSWIM 2008, October 2008. Kuan-Ta Chen, Andrew Liao, Hsing-Kuo Kenneth Pao, Hao-Hua Chu,“ Game bot detection based on avatar trajectory, in Proceedings of IFIP the 7th International Conference on Entertainment Computing (ICEC), September 2008. Arvin Wen Tsui, Wei-Cheng Lin, Hao-Hua Chu, Analysis and comparison between war driving and war walking in metropolitan WiFi radio maps, in the poster session of UBICOMP, September 2008. Jr-ben Tian, Ho-lin Chang, Tsung-Te Lai, Hao-Hua Chu, SpinTrack: Spinning Infrastructure Nodes for Precise Indoor Localization, in the poster session of UBICOMP, September 2008. [SCI] Ling-Jyh Chen, Chen-Hung Yu, Cheng-Long Tseng, Hao-Hua Chu, Cheng-Fu Chou, "A Content-Centric Framework for Effective Data Dissemination in Opportunistic Networks," IEEE Journal of Selected Areas in Communications (JSAC), Vol. 26, No. 5, June 2008, pp761-772. Pei-Yu Peggy Chi, Jen-Hao Chen, Hao-Hua Chu, Jin-Ling Lo, "Enabling calorie-aware cooking in a smart kitchen," International Conference on Persuasive Technology (PERSUASIVE 2008), Oulu, Finland, June, 2008. Jane Yung-Jen Hsu, Hao-Hua Chu, Polly Huang, "iCare project: adopting pervasive and persuasive computing for assisted cognition," Workshop on Intelligent Systems for Assisted Cognition, Rochester, New York, October 2007. Ju-Chun Ko, Yi-Ping Hung, Hao-Hua Chu, "Mug-Tree: a playful mug to encourage healthy habit of drinking fluid regularly," in the Late Breaking Results (LBR) session and Adjunct Proceedings of the 9th International Conference on Ubiquitous Computing (UBICOMP 2007), Innsbruck, Austria, September 2007. [SCI] Shun-Yuan Yeh, Keng-Hao Chang, Chon-In Wu, Hao-Hua Chu, Jane Yung-Jen Hsu, "GETA sandals: a footstep location tracking system," Springer/ACM Personal and Ubiquitous Computing Journal (PUC), Volume 11, Issue 6, August 2007, pp 451-463. Pei-Yu Chi, Jen-Hao Chen, Shih-Yen Liu, Hao-Hua Chu, "Designing smart living objects - enhancing vs. distracting traditional human-object interaction," in Proceeding of the 12th International Conference on Human-Computer Interaction (HCII 2007), July 2007, pp 788-797. [SCI] Chon-In Wu, Chao-Ming (James) Teng, Yi-Chao Chen, Tung-Yun Lin, Hao-Hua Chu, Jane Yung-Jen Hsu, "Point-of-capture archiving and editing of personal experiences from a mobile device," Springer/ACM Personal and Ubiquitous Computing Journal(PUC), Volume 11, Issue 4, April 2007, pp 235-249. Jen-hao Chen, Keng-hao Chang, Pei-yu Chi, Hao-hua Chu. "A smart kitchen to promote healthy cooking," in Poster Session & Adjunct Proceedings of the 8th ACM International Conference on Ubiquitous Computing (UBICOMP 2006), California, September 2006. Chuang-wen You, Yi-Chao Chen, Ji-Rung Chiang, Polly Huang, Hao-hua Chu, Seng-Yong Lau, "Sensor-enhanced mobility prediction for energy-efficient localization," in Proceedings of Third Annual IEEE Communications Society Conference on Sensor, Mesh and Ad Hoc Communications and Networks (SECON 2006), September 2006. [acceptance rate 26%, 63/243]. Ling-Jyh Chen, Chen-Hung Yu Tony, Sun Yung-Chih Chen, Hao-hua Chu, "A hybrid routing approach for opportunistic networks," in Proceedings of ACM SIGCOMM workshop on Challenged Networks (CHANTS 2006), September 2006. Chu-feng Lien, Hao-ji Wu, Hao-hua Chu, "Interactive care wall," in Proceedings of Workshop on pervasive display infrastructures, interfaces and applications, in conjunction with International conference on Pervasive Computing (PERVASIVE 2006), Dublin Ireland, May 7, 2006. (also published as Advances in Pervasive Computing 2006. in Adjunct Proceedings of the 4th International Conference on Pervasive Computing, Vol. 207, Austrian Computer Society), pages 33-36. Keng-hao Chang, Shih-yen Liu, Jr-ben Tian, Hao-hua Chu, Cheryl Chen, "Dietary-aware dining table - tracking what and how much you eat," in Proceedings of Workshop on Smart Object Systems, in conjunction with the Seventh ACM International Conference on Ubiquitous Computing (UBICOMP 2005), Tokyo, Japan, September 2005, pages 61-68. Shun-yuan Yeh, Keng-hao Chang, Chon-in Wu, Okuda Kenji, Hao-hua Chu, "GETA sandals: walk away with localization," in Demo Session & Adjunct Proceedings of the Seventh ACM International Conference on Ubiquitous Computing (UBICOMP 2005), Tokyo, Japan, September 2005. Hao-hua Chu, Chuang-wen You, Chao-ming Teng, "Challenges: wireless web services," in Proceedings of Workshop on QoS and Dynamic Systems, July 2004. Chao-ming Teng, Hao-hua Chu, Chon-in Wu, "mProducer: authoring multimedia personal experiences on mobile phones," in Proceedings of IEEE International Conference on Multimedia and Expo (ICME’2004), Taipei, Taiwan, June 2004, pages 1251-1254. Chao-ming Teng, Hao-hua Chu, Jane Yung-jen Hsu, "Making use of serendipity: a new direction for pervasive computing from a sociological view," Tech Notes & in Adjunct Proceedings of 2nd International Conference on Pervasive Computing (PERVASIVE 2004), Linz/Vienna, Austria, April 2004, pages 303-308. Chuang-wen You, Hao-hua Chu, "Replicated client-server execution to overcome unpredictability in mobile environment," in Proceedings of IEEE 4th Workshop on Applications and Services in Wireless Networks (IEEE ASWN), Boston, MA, August 2004, pages 21-29. [SCI] Hao-hua Chu, Henry Song, Candy Wong, Shoji Kurakake, Masaji Katagiri, "Roam, A seamless application framework," Journal of Systems and Software, Volumn 69(3), pages 209-226, January 2004. Candy Wong, Hao-hua Chu, Masaji Katagiri. A single-authoring technique for building device-independent presentations. W3C Device Independent Authoring Techniques Workshop, St. Leon-Rot, Germany, September 2002. Candy Wong, Hao-hua Chu, and Masaji Katagiri. GUI migration across heterogeneous Java profiles. in Proceedings of ACM CHI-NZ 2002, July 2002. Henry Song, Hao-hua Chu, Shoji Kurakake. Browser session preservation and migration. in Proceedings of WWW’2002, Hawaii, May 2002. [SCI] Hao-hua Chu Lintian Qiao, Klara Nahrstedt. A secure multicast protocol with copyright protection. ACM Computer Communication Review, Volume 32, Issue 2, pages: 42-60, April 2002. Hao-hua Chu, Henry Song, Candy Wong, Shoji Kurakake. Seamless applications over Roam system. ACM Ubitools (Part of UBICOMP 2001), Atlanta, September 2001. Hao-hua Chu, Lintian Qiao, Klara Nahrstedt. A secure multicast protocol with copyright protection. in Proceedings of IS&T/SPIE's Symposium on Electronic Imaging: Science and Technology, San Jose, January 1999. [SCI] C.S. Potter, Hao-hua Chu, B. Frey, C. Green, N. Kisseberth, T.J. Madden, K.L. Miller, Klara Nahrstedt, J. Pulokas, A. Reilein, D. Tcheng, D. Weber, B. Carragher. Leginon: A system for fully automated acquisition of 1000 electron micrographs a day. Ultramicroscopy Journal, vol. 77, pp. 153-161, North-Holland Publisher, July 1999. Hao-hua Chu, Klara Nahrstedt. CPU service classes for multimedia applications. in Proceedings of IEEE International Conference on Multimedia Computing and Systems (ICMCS'99), Florence, Italy, June 1999. [SCI] Klara Nahrstedt, Hao-hua Chu, Srinivas Narayan. QoS-aware resource management for distributed multimedia applications. Journal of High Speed Networks, Special Issue on Multimedia Networking, Volume 7(3,4): 229-258, IOS Press, March 1998. Hao-hua Chu, Klara Nahrstedt. A soft real time scheduling server in UNIX operating system. in Proceedings of European Workshop on Interactive Distributed Multimedia Systems and Telecommunication Services, Darmstadt, Germany, September 1997. Hao-hua Chu, Klara Nahrstedt, "Multi-path communication for video traffic," in Proceedings of HICSS-30, Maui, January 1997. Hao-hua Chu, Tsung-Te Lai, Yu-Han Chen, Polly Huang, “Method, apparatus and system for mapping pipeline,” U.S. Patent 8661909, filed August 2012, issued Mar 2014. Kai-Yin Cheng, Sheng-Jie Luo, Bing-Yu Chen, Hao-hua Chu, “Video playback system and method,” U.S. Patent 8364026, filed March 2010, issued Jan 2013. Polly Huang, Tsung-Han Lin, Hao-hua Chu, “Method of reducing power consumption of a radio badge in a boundary detection localization system,” U.S. Patent 8130103, filed Apr 2009, issued Mar 2012. Polly Huang, Hao-hua Chu, Chuang-Wen You, “Energy-efficient indoor localization system and a method of reducing power consumption of a radio badge in the indoor localization system,” U.S. Patent 8130103, filed Apr 2009, issued Apr 2012. Hoi Lee Candy Wong, Hao-Hua Chu, Masaji Katagiri, Yu Song, Shoji Kurakake, "Running state migration of platform specific graphical user interface widgets between heterogeneous device platforms," U.S. Patent 7934162, filed Oct 2002, issued Apr 2011. Hoi Lee Candy Wong, Hao-Hua Chu, Masaji Katagiri, Yu Song, Shoji Kurakake, "Layout of platform specific graphical user interface widgets migrated between heterogeneous device platforms," U.S. Patent 7895522, filed Oct 2002, issued Feb 2011. Hao-hua Chu, Shun-Yuan Yeh, Chon-In Wu, Kenji Okuda, “Footprint location system,” U.S. Patent 7671734, filed Feb 23 2007, issued Mar 2010. Yu Song, Hao-Hua Chu, Nayeem Islam, Masaji Katagiri, "Application mobility service," U.S. Patent 7386855, filed August 2002, issued June 2008. Hoi Lee Candy Wong, Hao-Hua Chu, Masaji Katagiri, Yu Song, Shoji Kurakake, "Transformation of platform specific graphical user interface widgets migrated between heterogeneous device platforms (II)," U.S. Patent 7386855, filed Aug 2002, issued Jun 2008. Hoi Lee Candy Wong, Hao-Hua Chu, Masaji Katagiri, Yu Song, Shoji Kurakake, "Transformation of platform specific graphical user interface widgets migrated between heterogeneous device platforms (I)," U.S. Patent 7392483, filed Aug 2002, issued Jun 2008. Yu Song, Hao-Hua Chu, Shoji Kurakake, “Secure sharing of personal devices among different users (II),” U.S. Patent 7380282, filed Jul 2006, issued May 2008. Hao-Hua Chu, Hoi Lee Wong, Yu Song, Shoji Kurakake, “Dynamic adaptation of GUI presentations to heterogeneous device platforms,” U.S. Patent 7234111, filed Sep 2001, issued Jun 2007. Hao-Hua Chu, Shoji Kurakake, “Method and system for effecting migration of application among heterogeneous devices,” U.S. Patent 7080159, filed Dec 2000, issued Jul 2006. Yu Song, Hao-Hua Chu, Shoji Kurakake, “Secure sharing of personal devices among different users (I),” U.S. Patent 7143443, filed Oct 2001, issued Nov 2006. Hao-Hua Chu, Yu Song, Shoji Kurakake, “Communication socket migration among different devices,” U.S. Patent 6920501, filed Dec 2001, issued Jul 2005. Hao-hua Chu, Shun-yuan Yeh, Chung-ying Wu, Kenji Okuda (NTU). 足跡追蹤系統 (Footprint tracking system), Taiwan Patent #I283759, July 11, 2007. Hao-hua Chu, 隨身影片剪輯系統與方法, Taiwan Patent #I221731, August 10, 2007. 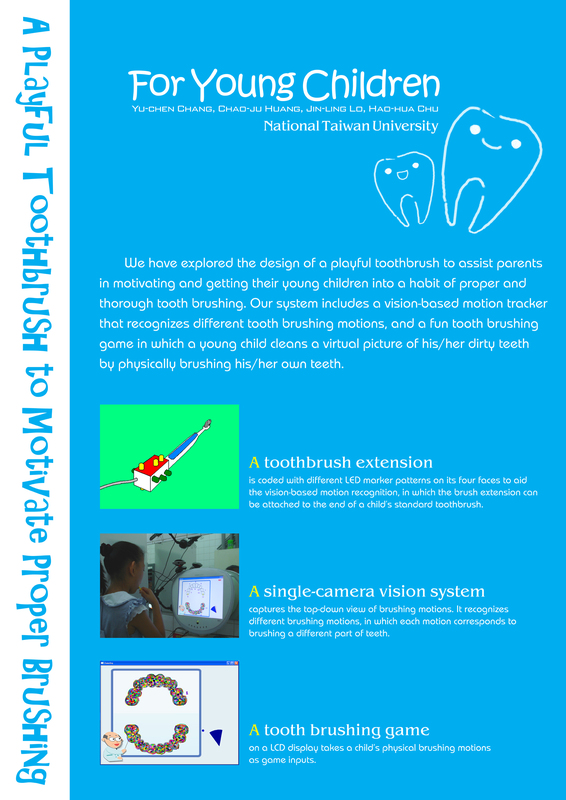 Tsung-Te Lai (賴宗德), "Single-Release Point Sensing," (以單一節點釋放的感測) PhD Thesis, Graduate Institute of Computer Science and Information Engineering, National Taiwan University, April 2013. Wen (Arvin) Tsui (崔文), "Accuracy Analyses and Improvements on Metropolitan-Scale Wi-Fi Localization," (都會範圍Wi-Fi定位準確度分析與改進之研究) PhD Thesis, Graduate Institute of Computer Science and Information Engineering, National Taiwan University, 2012. Chuang-Wen You (游創文), "Enabling Energy-Efficient Localization Services on Sensor Network Positioning Systems," (在感測器網路定位系統上促成高能源效率的定位服務) PhD Thesis, Graduate Institute of Computer Science and Information Engineering, National Taiwan University, January, 2008. Hao-hua Chu, "CPU Service Classes: A Soft Real Time Framework for Multimedia Applications," Ph.D. Thesis, Department of Computer Science, University of Illinois at Urbana-Champaign, August, 1999. Kuo-Cheng Wang (王國丞), 戒酒小幫手:運用智慧型手機系統協助酒癮治療, M.S. Thesis, Graduate Institute of Computer Science and Information Engineering, National Taiwan University, July 2014. Yi-Hsuan Hsieh (謝宜軒), 利用手機即時偵測車輛周圍的侵犯駕駛行為, M.S. Thesis, Graduate Institute of Computer Science and Information Engineering, National Taiwan University, July 2013. Hsin-Liu Kao (高新綠), 居家活動用電分配量測系統之研究, M.S. Thesis, Graduate Institute of Networking and Multimedia, National Taiwan University, July 2013. Bo-Jhang Ho (何柏樟), 利用熱感應之技術測量電器各別用電量及個人用電狀況, M.S. Thesis, Graduate Institute of Computer Science and Information Engineering, National Taiwan University, July 2013. Wei-Ju Chen (陳瑋儒), 於供水水管系統自動安裝感測器, M.S. Thesis, Graduate Institute of Computer Science and Information Engineering, National Taiwan University, July 2012. Ting-Lun Hsu (徐廷倫), 偵測兒童閱讀距離的穿戴式系統, M.S. Thesis, Graduate Institute of Computer Science and Information Engineering, National Taiwan University, July 2012. Kuei-Han Li (李奎翰), 在供水水管系統中架設無線感測網路, M.S. Thesis, Graduate Institute of Computer Science and Information Engineering, National Taiwan University, July 2012. Chen-Hung Yu (游鎮鴻), 臨機網路中基於Erasure Coding之路由與資料傳輸 M.S. Thesis, Department of Computer Science and Information Engineering, National Taiwan University, June 2007. Hao-Ji Wu (吳昊極), "Modeling and optimizing positional accuracy based on hyperbolic geometry for the adaptive radio interferometric positioning system," (利用雙曲線的幾何特性對於適性無線電波干涉定位系統的定位精準度進行模型化與最佳化) M.S. Thesis, Department of Computer Science and Information Engineering, National Taiwan University, June 2007. Chu-Feng Lien (連矩鋒), "Performance comparison between GSM and Wi-Fi localization in both indoor and outdoor environments," (室內及室外環境下之GSM/Wi-Fi定位系統分析比較) M.S. Thesis, Graduate Institute of Computer Science and Information Engineering , National Taiwan University, January 2007. Shun-Yuan Yeh (葉舜元), "GETA sandals: wearable indoor self location tracking system," (穿戴式室內人員自我定位系統) M.S. Thesis, Graduate Institute of Computer Science and Information Engineering , National Taiwan University, June 2006. Shin-jan Wu (吳欣展), "RFID-assisted physical object location tracking system," (利用無線射頻辨識技術輔助之物品位置追蹤系統) M.S. Thesis, Graduate Institute of Networking and Multimedia , National Taiwan University, July 2006. Keng-hao Chang (張耿豪), "Diet-aware dining table – a smart surface to observe tabletop dietary behaviors," (飲食感測餐桌 - 感測飲食行為之智慧平面) M.S. Thesis, Graduate Institute of Computer Science and Information Engineering , National Taiwan University, June 2006. Yi-Chao Chen (陳奕超), "Sensor-assisted Wi-Fi indoor location system for adapting to environmental dynamics," (利用感測器輔助可適應環境變因的無線網路室內定位系統) M.S. Thesis, Graduate Institute of Computer Science and Information Engineering , National Taiwan University, June 2006. Ji-Rung Chiang (蔣季融), "Collaborative localization: enhancing WiFi-based position estimation with neighborhood links in clusters," (合作定位：利用人群間鄰近連結改善無線網路定位系統之準確性) M.S. Thesis, Graduate Institute of Computer Science and Information Engineering , National Taiwan University, June 2006. Jr-Ben Tian (田知本), "Modeling and comparison of two time synchronization protocols," (兩種時間同步化協定的模型建立與比較) M.S. Thesis, Graduate Institute of Computer Science and Information Engineering , National Taiwan University, June 2006. Kenji Okuda (奧田健次), "The GETA sandals: A Footprint Location Tracking System," (日本木屐: 利用足跡追蹤位置系統) M.S. Thesis, Graduate Institute of Computer Science and Information Engineering , National Taiwan University, June 2005. Chon-in Wu (吳忠穎), "Point-of-capture archiving and editing of personal experiences from a mobile device," (隨身影片編輯系統) M.S. Thesis, Graduate Institute of Computer Science and Information Engineering , National Taiwan University, July 2005. "Competitiveness Report: Assistant‐Level Faculty Hiring in Selective Computer Science Programs in Hong Kong, Singapore, Korea, Taiwan, and the U.S. (2006‐2009)", December 2009. "Competitiveness Report: Computer Science Top Conference Performance Comparison and Collaboration in East Asia countries of China, Hong Kong, India, Japan, Korea, Singapore, Taiwan (2002-2006)", December 2006.